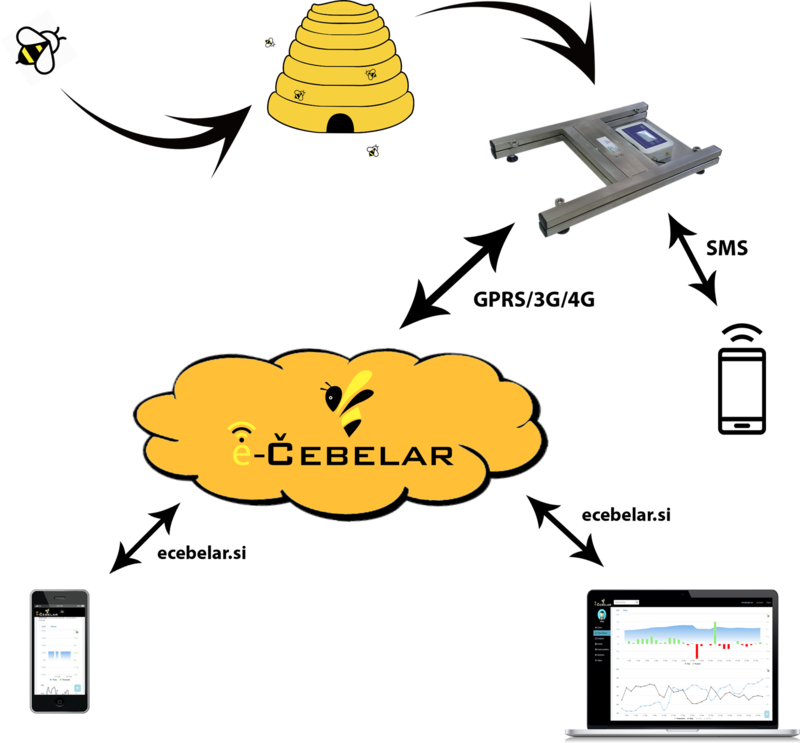 e-Cebelar is a system designed for anyone who lovingly or professionally deals with beekeeping. The purpose of the application is to collect and process data that can be obtained through measurements in your own beehives or by published measurements from other users. TCM-13A is a measurement station for predicting and controlling honey. Basically, this is an electronic scale with temperature and humidity sensors and a GSM data modem. It is intended for integration into the control system of honey for beekeepers who want regular information about the weight, temperature and humidity in their dislocated areas. In addition to monitoring measurements in your locations, you can also monitor measurements in locations that were shared by other users of the e-Cebelar application. Robust and waterproof body, made of stainless material. Continuous operation for at least 3 years with one battery. Warranty: 3 years. More than 100 scales have been used throughout Slovenia and Croatia. Scales are included in the Slovenian Honey Forecasting System, which have been in use for more than 15 years. Notification of the need for feeding bees or filling honey. Alarms via SMS in the event of burglary into the beehive. System e-Cebelar is meant for? The system is designed for those who are professional or amateur beekepers and in need of an effective notification system about the situation (weight of hives, temperature and relative humidity) in the hive. How often do measurements take place? Temperature and humidity measurements are performed every full hour, the mass of honey is measured before sending data, which can be set at any time 2 times a day. Where is the measurement data sent? Data can be sent to your phone in the form of SMS, on e-Čebelar servers or both. Can the scale be set to send measurement data several times a day? Yes, the scale can send data 1 or 2 times per day. Where can I buy a new battery? You can order a new battery with us. Order new battery. Is the scale protected from water and dust? The TCM-13A scale is dust and waterproof with IP65 level, however, we advise that the scale is adequately protected against direct water. Is the use of the web application ecebelar.si free? The web application can be used within 3 pricings, one of which is free. You can see details for each pricing here. How is the data transmitted to the e-Cebelar web application? Data is transmitted via SMS messages or via GPRS network. Therefore, for the normal operation, you need an active SIM card and a location where theres at least a network with a GSM signal. Can I track measurement from multiple scales in e-Cebelar? 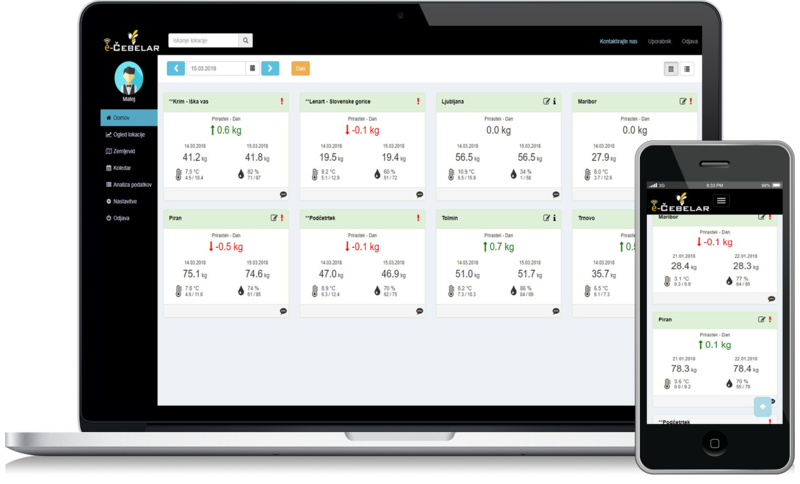 In addition to any number of your own scales and hive locations, you can also monitor measurements shared by other users. What are the benefits of the eČebelar system to the competition? The beekeeper scale TCM-13A, works with one battery at least 3 years while sending data every day, which means that you do not need additional power sources or solar panels. All data sent to the ecebelar.si web application is stored and made available for subsequent analysis/processing. Only quality and verified parts are built into the TCM-13A scale, which allow accurate and credible metrics even after several years of use. Can I access other users data? In the ecebelar.si application, you can also monitor measurements, which were marked by other users as public. You can also enable public access of your measurements. How often do you need to change the battery? The TCM-13A is designed to consume a minimum amount of electricity. To ensure smooth operation scales use for operation a D size battery, at least 3 years in normal operation (sending data 1x per day and no intermediate reading data from scales). What material is made of the scales? The scale is entirely made of stainless steel INOX steel. What is the maximum load on the instrument? The scale has a built-in measuring cell that transfers loads up to 150kg or up to 200kg . Normally a 150kg cell is installed, but can be replaced by a 200kg cell at the customer's request. Are weight measurements sensitive to temperature changes? The scale uses a high-quality measuring cell that is not sensitive to temperature fluctuations. Is it possible for the scale to be under constant load? 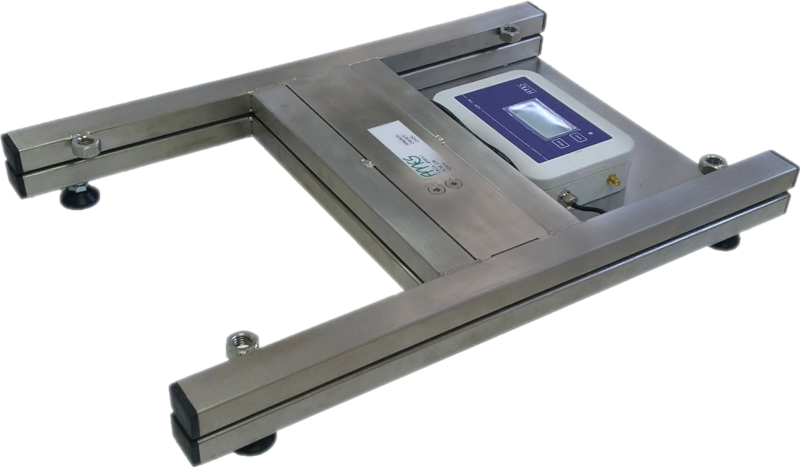 A high-quality measuring cell is used in the scale, the cell is designed so that its properties do not change despite the constant multi-annual load. Is measurement sharing with other users mandatory? Sharing measurements with other users is only mandatory if you use a free version of the application. You can see the prices and differences between versions here. I'm pleased with the scale. It's been serving me for two seasons very well. For a long time I studied the offer of beekeper scales. The most important thing to me was the quality and robustness of the workmanship and how data was displayed in application. I have found that the AMES beehive scale TCM-13 is the most appropriate product, which was accessible on the market. I'm currently using two scales. I found that the real advantages of application come to the fore when you integrate a large number of scales into the system. A great advantage is also the availability of support and openness to upgrading the system, which is extremely important after purchase for the customer. AMES's Beekeeping Scale names it all. The most advanced scale I have found on the fair. Extremely high-quality design, user-friendly application and excellent customer support. I recommend! The Beekeeper Association of Slovenia with its observation and forecasting services now uses 60 scales for more than 14 years and automatically informs beekeepers about their daily positive or negative yield. We are very pleased with the selection of Ames scales because they are high-quality, precise, reliable, long-lasting and low maintenance costs. 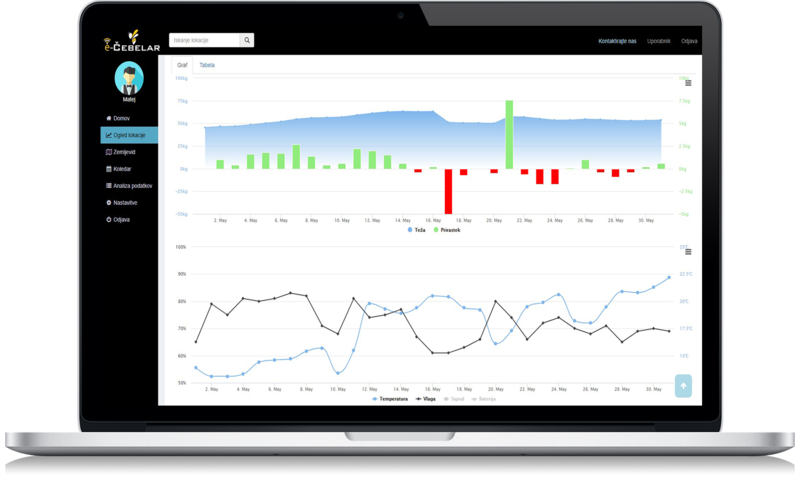 In addition, it is very important that Ames's eČebelar web application can easily monitor the weight, temperature, and humidity data from any device that has an internet connection. Data is available from the first day of the activation of the instrument and can be displayed in a table or chart format. In addition, the site contains a number of useful tasks from the map of Slovenia, weather forecasts and the ability to write notes that facilitate the keeping of notes and monitoring the honey levels. *I agree with general terms. Made with by AMES d.o.o. 2018. All rights reserved.